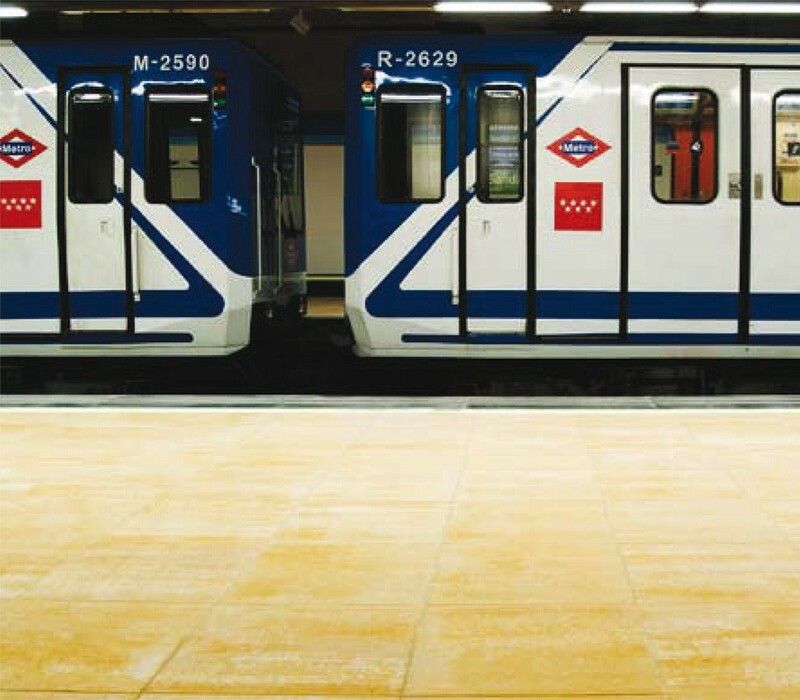 Adhesion, understood as the strength of the bond between the ceramic piece and the base, plays a vital role in the quality of the tiled surface. Good adhesion should guarantee that the tile is firmly fixed to the base. The development of new low porosity ceramic materials that are resistant to abrasion and sub-zero temperatures, large formats, and their installation in industrial or large commercial areas, facades, etc., has led to a corresponding development in adhesive products. Increased knowledge about the use of special adhesives means that thick layer installation (mechanical adhesion) is being replaced by thin layer installation (chemical adhesion); the latter offers clear advantages, particularly in relation to quality of both adhesion and durability. The appropriate adhesive must be chosen, taking into account the surface to be tiled and the type of ceramic tile. It is very important to use the right tools when laying the tiles (notched trowel, white rubber mallet, spirit level and suction cup). The substrate on which the tiles are to be laid must also be free of any plaster, paint residues etc., thus enabling the adhesive to be effective over time. Movement joints, whether structural, perimeter, dilation or laying joints, must always be respected for a perfect installation. These must always follow the instructions given in the project by a specialised engineer or architect. These must be continuous and no less than 8 mm wide. Their purpose is to insulate the ceramic floor tiles from other tiled surfaces such as walls (hidden by the skirting), columns or doors. The omission of perimeter joints is one of the most frequent causes of ceramic tile lifting. Partition or expansion joints are used to allow for deformations caused by the temperature variations between the tile, the adhesive and the substrate. 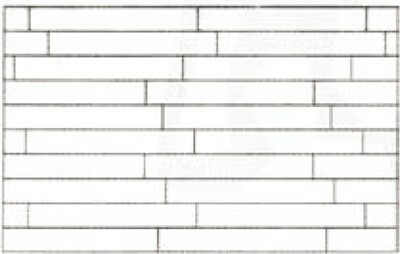 Large tiled surface areas must be subdivided into smaller sections, delimited by partition joints, in order to void stress caused by expansion and contraction. 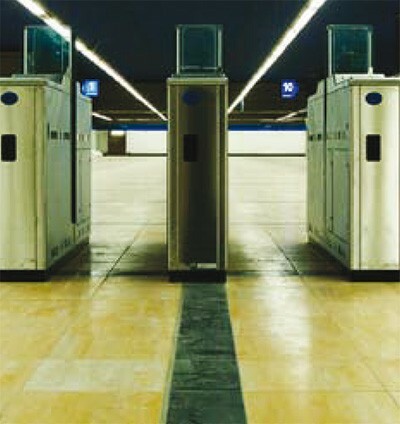 Where floors are subject to high pedestrian traffic, hard wheels or the dragging of heavy loads, specially designed partition joints suitable for heavy loads must be used. To protect against any structural (expansion-contraction) movements, a separation joint must be fitted between all contiguous tiles. These should be laid with aseparation of no less than 2-3 mm. Installation joints offer several advantages: they help to absorb deformations caused by the substrate and ameliorate the stress generated on the bottom of the tile when the floor is subject to loads. Accumulated stress may eventually cause tiles to lift. They also have an important aesthetic function and highlight the beauty of the tile. The joints can have a smooth finish, level with the tiles, or a sunken concave finish. They are generally applied to interior and exterior tiled walls. Low porosity, deformable and water-resistant grouts are also available. Suitable for facades, floors subject to heavy and local traffic with persistent presence of water. For surfaces where the presence of acids and alkalis is commonplace, such as food or health related premises, two-component reactive resins such as epoxy grouts should be used. This type of grouting material is composed of synthetic resins (usually epoxy resin). Their main properties are: resistance to chemicals, bacterial resistance, very good resistance to damp and excellent resistance to abrasion. The minimum separation between tiles should be no less than 2-3 mm for interiors and 3-5 mm for outside areas. Classification of grouts according to the EN 13888 standard. Generally two-component grouts, epoxy based, resistant to chemicals, completely impermeable and highly resistant to compression. The use of grouts containing micronised carbon (carbon black) should always be avoided. 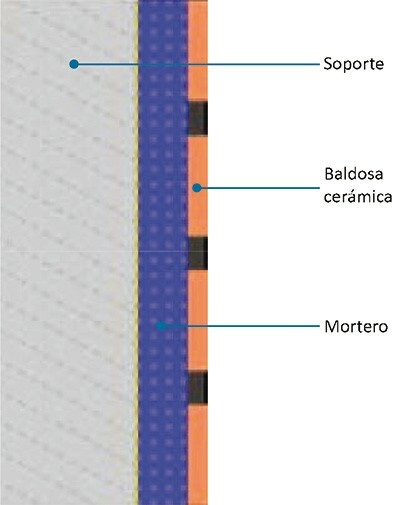 Two techniques are used for laying ceramic tiles: the thick layer and the thin layer methods. It is very important to remember that the installation of porcelain stoneware requires the substrate to be completely level and free of any substances that may interfere with efficient adhesion. The thin layer technique must always be employed, using a notched rowel, a white rubber mallet, a spirit level and a suction cup. 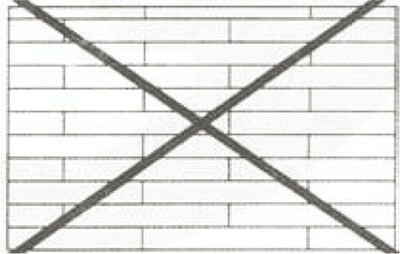 For outside applications and formats larger than 900 cm2, the double bonding technique should be used, i.e., the adhesive is applied to both the substrate and the back of the tile. 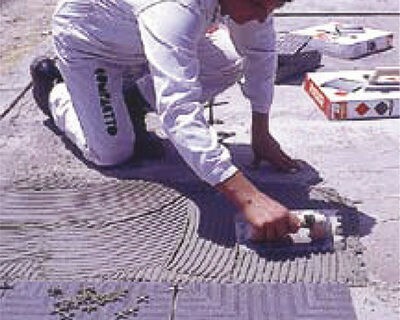 This is the traditional technique for laying tiles, whereby the tile is laid directly onto the substrate (partition wall, brick, reinforced concrete). This is a cheaper me thod and also enables defects in levels to be corrected. 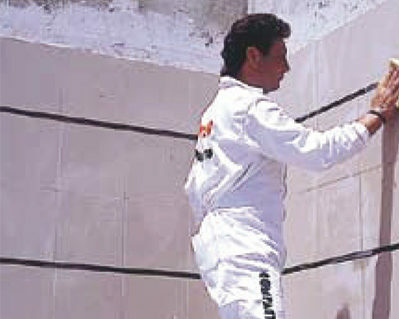 The adhesive material used with this method is traditional mortar. The thin layer method, (with adhesives). This is a more recent technique, adapted for use with modern ceramic materials and a wide range of substrates. The tiles are usually laid on a previously prepared base, whether plastered walls or a cement floor base. This technique has clear advantages: it is suitable for any type of ceramic tile and is compatible with all substrates. Appropriate adhesives are available for all types of base and ceramic tiles and they offer ample rectification time. They absorb any deformation in the substrate and their adhesive performance is higher. 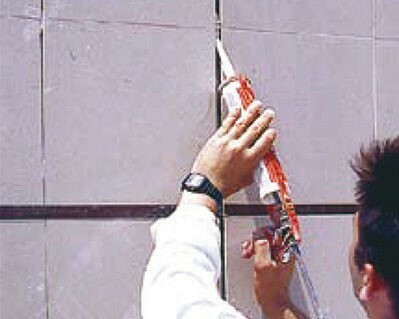 The adhesive materials used with this method are cement-based adhesives, adhesive pastes and reaction resin adhesives. The following types of cement glues may be considered, depending on the properties of the ceramic tile to be laid. 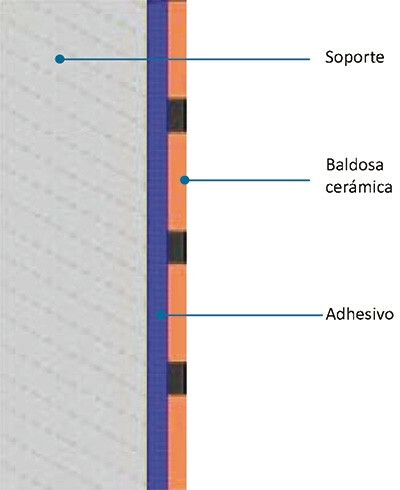 Adhesives are classified according to the EN 12004 and 12002 standards for ceramic tile adhesive and deformability. The low porosity of porcelain stoneware tiles makes them highly resistant to staining. However, if certain strong dyes are spilled or accidentally come into contact with the surface of the polished or semi-polished porcelain stoneware tile, staining may occur if it is not cleaned immediately. It is therefore advisable to clean up any spills as quickly as possible. Once the tiles have been laid and grouted, a cement film or residue can usually be seen on the surface of the tiles. These residues can normally be removed with a diluted acid solution. 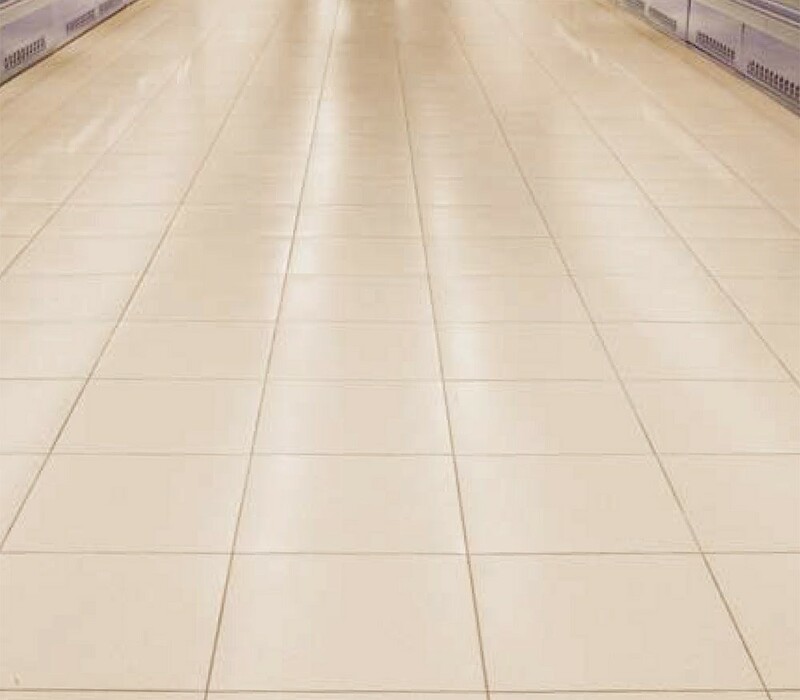 *Acid-based products should never be used to clean recently laid ceramic tiles; the acid reacts with the unset cement, which may damage the joints or deposit insoluble compounds on the surface. *Surfaces should be soaked in clean water before carrying out any treatment using chemicals (installation joints). *Routine maintenance consists of regular cleaning with water and a diluted ammonia-based detergent. * When more thorough cleaning is required to eliminate stains or scaling that have penetrated the surface and cannot be removed by regular procedures, any aggressive stain removal product should first be tested on a spare tile. Chemical degradations that could worsen the condition of the tile should be avoided. *Metal spatulas or abrasive scourers should not be used. *After installation, floor tiles should be covered with cardboard, sawdust or similar to protect them from damage during any subsequent work. The right tools should be used to cut and perforate porcelain stoneware tiles in order to avoid breakages or any other damage. To make straight tile cuts, use a hand tile cutter with a Widia scoring wheel, wet cut diamond blade tile cutter and/or a low-power radial-arm tile saw with a continuous rim diamond blade. To perforate or make holes in a porcelain stoneware tile, use a diamond-cutter drill bit. In this case electric drills should not be used in the hammer mode; the area being perforated should be cooled with water regularly to prevent the temperature rising and the drill bit melting. Floor tile patterns with a broken joint overlap of more than 14 cms are not recommended.